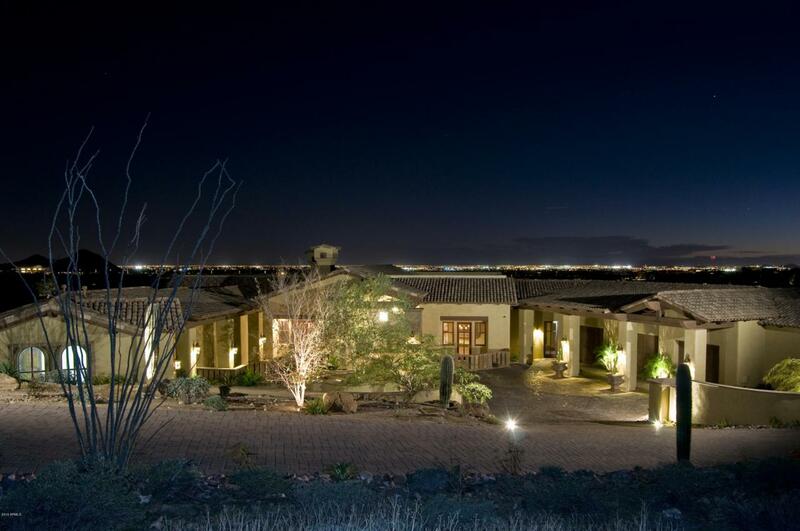 This Exquisite Luxury Estate is an entertainers dream, + your own private sanctuary. This beauty is perfectly nestled at the foot of the McDowell Mountains. Privately gated 200ft tree lined driveway leads to this magnificent home. Views & property placement-simply stellar !Layout is flowing, spacious, dramatic & open-with perfectly sized rooms. One of a kind unique design & detail w/ finest finishes. European cobblestone auto court, Cantera columns & balustrade architectural detail. Massive Tuscan iron entry doors open to great room w/ soaring Cantera fireplace & disappearing doors that bring the outdoors in. Beautifully designed kitchen w/ hand carved alder cabinetry-ceiling treatments-premium appliances & 14ft pantry. Climate controlled wine room & wet bar.